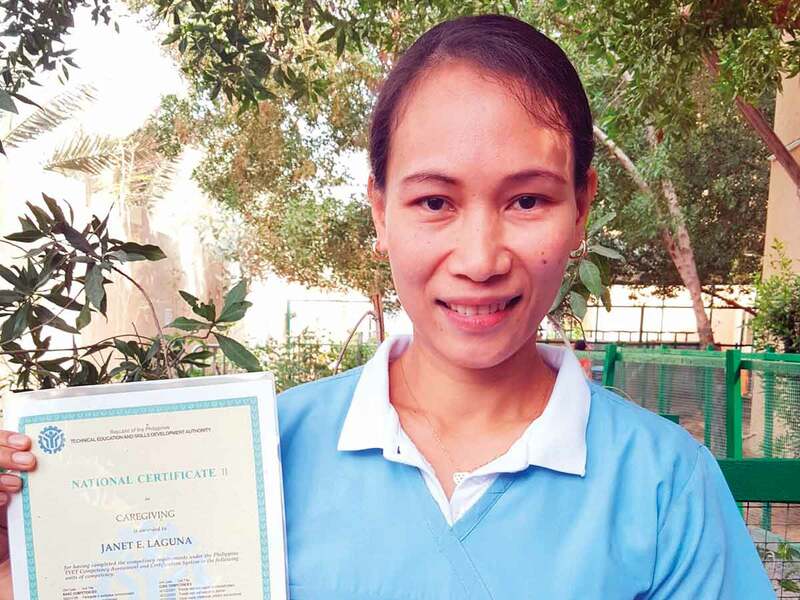 Dubai: Janet Laguna juggled working full-time as a maid and studying to be a caregiver for six months, often sacrificing her days off and much-needed sleep, but on Friday all that hard work and dedication paid off when the Filipina expatriate graduated top of her class and became a certified caregiver. Laguna, 40, has been working as a maid for the past seven years in the UAE. She decided to study as a caregiver so she could explore other work opportunities here or abroad. “My employer was very supportive and proud that I topped my class,” she added, with tears welling up. “I would often review and study at night and go to my class on my days off, but all that sacrifice is worth it. “This is a realisation of a dream. I will start pursuing work as a caregiver in the UK maybe later this year. Bit by bit, I’ll accomplish my dreams for my family,” the mother of one said. 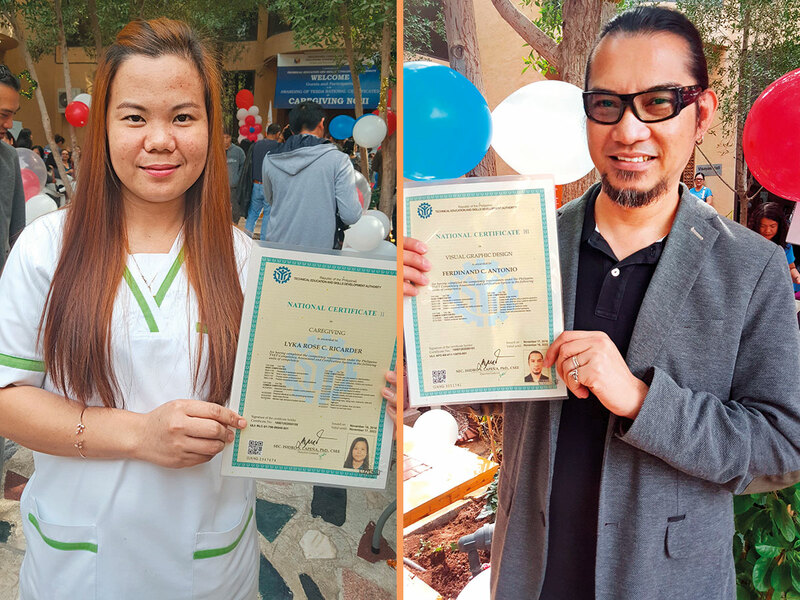 Laguna was one of 167 Filipinos who graduated and were certified by the Technical Education and Skills Development Authority (Tesda) at the Philippine Overseas Labour Office in Dubai on Friday. The majority work as maids and nannies in Dubai and the northern emirates. The ‘upskilling programme’ is a Philippine government policy, which offers courses such as caregiving, visual graphics, massage therapy and more from Tesda-accredited organisations. Philippine Consul-General Paul Raymund Cortes said this Friday’s batch of graduates was the largest in three years. “The policy of our government is to upgrade the skills of our people so that in a 21st century society that is increasingly competitive, they will have the skill and willingness to be competitive as well, and hopefully get better opportunities,” he said. Labour Attache Felicitas Bay said being Tesda-certified has many perks. “Some graduates have been promised promotion by their employers after getting their certification. Some are eying a different line of work. They’re looking forward to greener pastures like working in Canada,” she said. Another graduate Lyka Rose Ricarder, 27, said getting certified for free would give her career an extra boost. “I finished my caregiving course in the Philippines,” she said. “There were 12 of us in the class but I was the only one who did not get certified because we did not have the money then. But thank God I got the certification here for free. I am proud of myself,” she added. Freelance art director Mac Antonio, who also received his certification in visual graphics on Friday, said this graduation is extra special. “I took several courses in college including architecture and fine arts,” he said. “But I was not able to graduate and get a diploma. It’s hard to get a good offer and advance in your career if you don’t have a diploma. I’ve been working in my field for 25 years and this certificate will help me in my career,” he added.